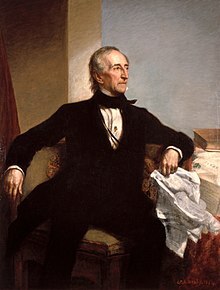 ჯონ ტაილერი (ინგლ: John Tyler) (დ. 29 მელახი, 1790 — ღ. 18 ღურთუთა, 1862) — ააშ-იშ რანწკით მავითა პრეზიდენტი 1841-1845 წანეფს. რდჷ ააშ-იშ ვიცე-პრეზიდენტი (ვიგეფიშ პარტიაშე) 1841 წანას, დო შტატი ვირჯინიაშ გუბერნატორი 1825-27 წანეფს. Chitwood, Oliver Perry (1964) [Orig. 1939, Appleton-Century]. John Tyler, Champion of the Old South. Russell & Russell. Kruman, Marc W.; Brinkley, Alan (eds.) (2004). The Reader's Companion to the American Presidency: John Tyler. Houghton Mifflin Company. ISBN 978-0-395-78889-9. Lambert, Oscar D. (1936). Presidential Politics in the United States, 1841–1844. Durham: Duke University Press.